As part of the military of the United Arab Emirates, the United Arab Emirates Army is responsible for land operations. UAE army soldiers in a joint training exercise with South Korean soldiers in United Arab Emirates. The Union Defence Force were used on two occasions in Sharjah. They exist to further the foreign and domestic policies of their governing body and to defend that body and the nation it represents from external and internal aggression, the terms "armed forces" and "military" are often treated synonymously, although in technical usage a distinction is sometimes made in which a country's armed forces may include both its military and other paramilitary forces. Armed force is the use of armed forces to achieve political objectives. In February 1973 following a brief border war between armed Bedouin tribesmen from both Sharjah Emirate and Fujairah Emirate over a disputed area of land which covered a quarter of an acre and included water wells and date palm trees. 22 people were killed and another 12 were wounded before UDF troops were able to impose a ceasefire. During the War against Iraq, UAE troops reported that they have deployed several thousands of men in that engagement. The UDF participated in the conflict as part of the GCC, as part of the Peninsula Shield force that advanced into the city of Kuwait. United States military aviation bombed the Iraqi positions from the UAE, and United States ships operated out of UAE ports along the coast of the Persian Gulf. The UAE Air Force also carried out strikes against Iraqi forces. A total of six UAE combat deaths were reported as a result of these battles. During the 2015 Yemeni Civil War the United Arab Emirates Army (together with Saudi Army soldiers)intervened in support of fighters loyal to the ousted regime of Abd Rabbuh Mansur Hadi against Houthi militants. UAE troops assisted anti-Houthi fighters in the re-taking of the strategic southern Yemeni port city of Aden and also Al Anad Air Base, the largest airbase in Yemen. On 4 September 2015 the army suffered its heaviest loss in modern history, losing 52 soldiers in war in Yemen to a tactical ballistic missile strike. The UAE has since deployed an entire armoured brigade to Yemen. Up until May 2017 the UAE forces have suffered 89 casualties. On 3 May 2018, the United Arab Emirates deployed over 100 troops, artillery and armoured vehicles to the Yemeni archipelago of Socotra in the Arabian Sea without prior coordination with the internationally recognised Government of Yemen. Shortly after landing, UAE forces expelled Yemeni soldiers stationed at key installations, including Socotra Airport and the flag of the United Arab Emirates was raised above official government buildings in Hadibu. France Main Battle Tank 434 388 + 46 armoured recovery vehicles, as of March 2018. Poland Armoured personnel carrier 40 The United Arab Emirates Army ordered an initial evaluation batch of 15 vehicles. Some of these vehicles will be equipped with the Patria Nemo turret while others will be equipped with BMP-3 turrets and have therefore been slightly modified, including a somewhat longer hull. In January 2016, the General Headquarters of the UAE armed forces ordered 40 Patria AMV hulls with the option of 50 more. The vehicles were shipped in June 2016 from Patria's Polish production line. The Patrias are used in Yemen in combat operations. Ukraine Armored personnel carrier 90 Used By UAE Marines and 90 Guardians. Turkey Armored fighting vehicle 133  133 ACV-300 in service. Russia Infantry Fighting Vehicle 598 250 for Abu Dhabi & 402 for Dubai (of which 391 delivered in 1992–1997) with "Namut" thermal sight and other modifications. They are under further upgrade with modular armour "Kaktus" and UTD-32 engine. United States MRAP Category 1 & 2 3,375 3,375 MaxxPros of various versions on order. 222 operational In September 2014, the U.S. approved a $2.5 billion deal with the United Arab Emirates Army for over 4,500 surplus U.S. MRAPs for increased force protection, conducting humanitarian assistance operations, and protecting vital international commercial trade routes and critical infrastructure. 1,150 vehicles were Caimans. West Germany NBCRS (Nuclear Biological Chemical Reconnaissance System) 32 32 Fuchs 2 NBC reconnaissance vehicles ordered in February 2005 under a contract valued at EUR160 million (USD205 million). The order comprises 16 NBC reconnaissance vehicles, eight bio vehicles and eight command post vehicles, which will provide the UAE with a complete NBC detection capability linked to a command-and-control system. United Arab Emirates Multiple rocket launcher 24 world's largest multiple rocket launcher unique to the United Arab Emirates Army. West Germany Handgun 9×19mm Parabellum P7M13 variant. United Arab Emirates Handgun 9×19mm Parabellum Primary service issued pistol. West Germany Submachine Gun 9×19mm Parabellum . United Arab Emirates Assault Rifle 5.56×45mm NATO Primary service issued rifle. Rifles are engraved honoring Colonel Sultan Mohammad Ali Al Ketbi. France Bullpup assault Rifle 5.56×45mm NATO In use with the Special Forces. Soviet Union Assault Rifle 7.62×39mm Arsenal is captured or collected from enemy. Belgium Assault Rifle 7.62×51mm NATO In reserve since 2010. West Germany Battle Rifle 7.62×51mm NATO In reserve. United States Carbine 5.56×45mm NATO Previous standard issue service rifle. Purchased 2,500 M4 carbines in 1993. United States Assault Rifle 5.56×45mm NATO In reserve. Belgium Light machine gun 5.56×45mm NATO Standard light machine gun of the United Arab Emirates Army. West Germany General-purpose machine gun 5.56×45mm NATO HK23E variant. United States Heavy machine gun 12.7×99mm NATO Standard heavy machine gun United Arab Emirate. Mostly as vehicle armament. United States Anti-materiel rifle 12.7×99mm NATO Standard Issue Sniper Rifle. ^ al-Shamahi, Abubakr. "UAE mourns losses in Yemen". Alaraby.co.uk. Archived from the original on 12 November 2017. Retrieved 24 May 2017. ^ Gardner, Frank (25 September 2015). "Yemen conflict: No end in sight, six months on". Bbc.co.uk. Archived from the original on 30 November 2016. Retrieved 16 January 2017. ^ "UAE: 'War is over' for Emirati troops in Yemen". Al Jazeera. Archived from the original on 2 February 2017. Retrieved 1 February 2017. ^ "UAE soldier dies in Yemen". Gulf Business. 6 September 2016. Archived from the original on 13 March 2017. Retrieved 1 February 2017. ^ "Emirati soldier martyred in Yemen". Gulf News. 2 May 2017. Archived from the original on 17 May 2017. Retrieved 24 May 2017. ^ "UAE deploys troops to Yemen's Socotra island". The Daily Star Newspaper - Lebanon. 7 May 2018. Archived from the original on 7 May 2018. Retrieved 7 May 2018. ^ "Anger erupts on Yemen's Socotra as UAE deploys over 100 troops". Al-Jazeera. Archived from the original on 7 May 2018. Retrieved 7 May 2018. ^ "Artem Defence" (PDF). Artem-defense.com. Archived (PDF) from the original on 7 July 2011. Retrieved 20 March 2018. ^ "Image of Patria AMV with BMP-3 turred at IDEX 2007". Armyrecognition.com. Archived from the original on 19 March 2016. Retrieved 20 March 2018. ^ "UAE orders Patria AMVs | IHS Jane's 360". Janes.com. Archived from the original on 30 January 2016. Retrieved 30 January 2016. 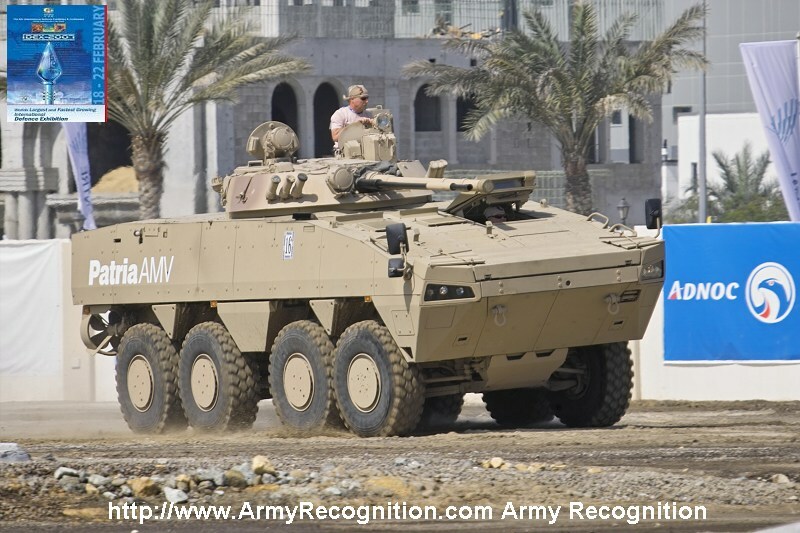 ^ "Patria AMV 8x8 armored combat proven in Yemen with UAE army - December 2017 Global Defense Security news industry - Defense Security global news industry army 2017 - Archive News year". Armyrecognition.com. Archived from the original on 15 December 2017. Retrieved 20 March 2018. ^ a b "Trade Registers". Armstrade.sipri.org. Archived from the original on 14 April 2010. Retrieved 20 June 2013. ^ "UN Register of Conventional Arms – UNODA". disarmament.un.org. Archived from the original on 14 December 2008. Retrieved 20 March 2018. ^ "ACV-S Tracked Armoured Combat Vehicle". Arny-Technology. Archived from the original on 7 April 2014. Retrieved 9 May 2014. ^ "ЦАМТО / Новости / Россия завершает программу модернизацию части парка БМП-3 армии ОАЭ". Armstrade.org. Archived from the original on 21 March 2018. Retrieved 20 March 2018. ^ a b "Emirates' Fuchs will be most advanced yet". IHS Jane's. 10 May 2005. Retrieved 4 May 2016. ^ "G6 155mm Self Propelled Howitzer, South Africa". Army-technology.com. Archived from the original on 6 September 2012. Retrieved 1 January 2010. ^ a b c d e f Jones, Richard D. Jane's Infantry Weapons 2009/2010. Jane's Information Group; 35 edition (27 January 2009). ISBN 978-0-7106-2869-5. ^ "UAE Armed Forces Unification Day: Report". Emirates News Agency. 4 May 2017. Archived from the original on 1 April 2019. Retrieved 4 October 2018. ^ "UAE firearms manufacturer Caracal sees huge growth potential". Gulf News. 26 February 2015. Archived from the original on 3 October 2018. Retrieved 3 October 2018. ^ Richard D. Jones; Leland S. Ness, eds. (27 January 2009). Jane's Infantry Weapons 2009–2010 (35 ed.). Jane's Information Group. ISBN 978-0-7106-2869-5. Archived from the original on 4 April 2019. Retrieved 20 March 2018. ^ Daniel Watters. "The 5.56 X 45mm: 1990–1994". Archived from the original on 4 January 2010. Retrieved 25 March 2009. ^ "UAE `given guns' for Chen visit". Taipeitimes.com. Archived from the original on 21 March 2018. Retrieved 20 March 2018. ^ Samuel Ramani. "Why Did the UAE Purchase Weapons From North Korea?". Thediplomat.com. Archived from the original on 9 August 2017. Retrieved 9 August 2017. ^ United States, Congress. House. Committee on International Relations (2000). U.S. Policy Toward North Korea: Hearing Before the Committee on International Relations, House of Representatives, One Hundred Sixth Congress, First Session, Part 2. U.S. Government Printing Office. pp. 91–92. ISBN 9780160607646.